I'm going to build a small run of boards, and was looking for a vacuum tweezers to simplify my work. I couldn't find any for sale, so I built them myself; here are some notes on the construction. This weekend, a main three-phase circuit breaker gave out. We tripped it with a short circuit on an old drill, and were unable to turn it on. I had it replaced (it's illegal to do it by myself) and opened it, just to see what exactly failed and what's inside anyway. When I was at it, I illustrated a few photographs to show how different modes work. I've been using my Manson powersupply for some time and have been happy with it. It works like a charm, has a lot of power, and can be easily controlled via USB interface (serial emulation). The only downside is the fan, although thermally controlled, it's real noisy when it's running. As I replaced it with a new one, I took a few photos of the internals. I do have one of these meters for a long time, and recently purchased another one. I was surprised it not only looked differently, but also behaved differently (clicky keys, annoying beeps after every keypress). Both of them have the "Auto power off" feature, which really annoys me, sice they beep and turn off frequently on my bench. I decided to look around for a good meter and found out, that many meters on the market have the same chip, and was curious if there is a way to improve me meter, that is, turn off some of it's features. I bought a Garmin Chirp, as I was interested in what makes it tick, and wanted to make a custom one, possibly with a bit more (interactive) functions. The old problem for people using both the headphones and speakers, is how to switch between them. As I like my music good-sounding, I quickly found out that using switchable front panel "HD-audio" is a no-go. The crappy cable leads from the bottom of the case, where my sound card is, to the top, where the front panel is, it's full of noise I quickly get sick of. I wanted something simple to switch it, and here it is, my stand that even switches the output for me! The MSP430 controllers contain small amount of flash, called "information memory" (since it's meant to contain information, of course), that you can use at your will. Programming in C, I expected GCC to do the right thing and tried to use the simple code. The Accucell charger is one of many clones of this kind. They all seem to be similar, but a bit different. I only have Accucell 6, and developed this tool for it. If it works on another charger, please, let me know! I've bought the inverter for cheap in the outlet. As I assumed it's not fully working, I decided to have a look first. I bought a dirt-cheap, no-name wifi "3g" AP on ebay, in hopes I could get OpenWRT working on it and perhaps use it in some of my projects. I decided to take a look inside. 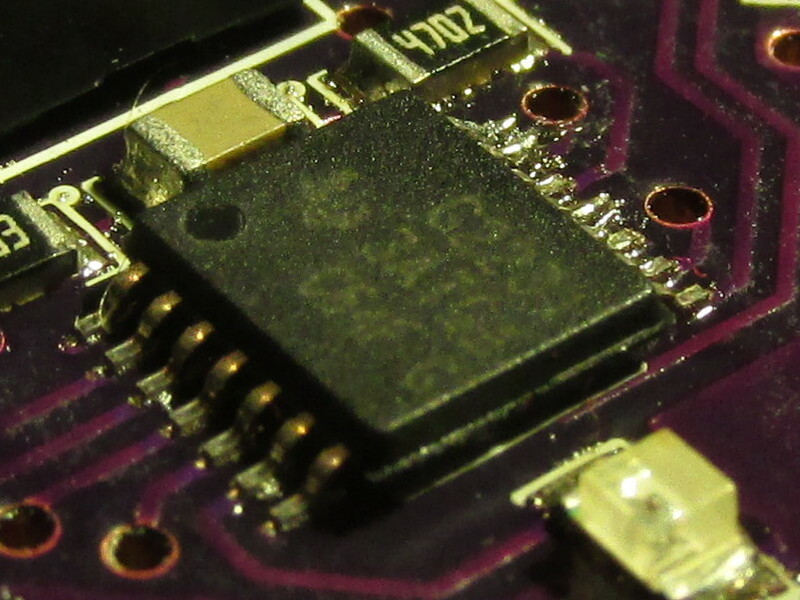 It opens easily, has UART pins clearly marked (and working). The board is marked as revision 2.1, has 32MB RAM and integrated 1800mAh Li-Ion battery. It seems to a MPR-A1 clone. Unfortunately, the firmware is in Chinese. Fortunately, it turns out the internet has already successfully ported OpenWRT on it, although the official wiki is not exactly verbose. When working with mains voltages, one needs to be very careful not to be electrocuted. Isolation transformer can help mitigate the risk (but will NOT make it safe), and as I had none, I decided to build one myself from two UPS transformers. I have three old 320GB hard drives for some time now. They are all IDE and all unused. I decided to make a backup machine which would sit at home and be handling daily backups. Here are my attempts on analyzing the board's power consumption and tuning it. One day, my computer refused to boot properly, and the hard drive was at fault. It sounded like it's trying to read something, unsuccessfully (not the sound of heads scraping the plates, but rather a click of death -- the head seeking all over again). After a while, the BIOS gave up and the drive went silent. After some trial and error, my drive booted in another SATA port and worked just fine. I thought that probably the port or cabling is bad, it happens.